BRUSSELS, BELGIUM--(Marketwired - Dec 30, 2013) - There's something to be said for magic. It makes a great plotline for movies and adds a layer of excitement to holidays. But taking the concept to an entirely new level is the Ice Magic package now available at the Brussels Marriott Hotel and the Renaissance Brussels Hotel. With competitive rates, numerous perks and some of the most convenient hotel locations in the city, this is one promotion that makes magic an attractive reality. No matter which Brussels, Belgium hotel travelers opt to stay in, they will encounter an enticing blend of history and luxury. Guest rooms are coolly contemporary, amenities including high-speed Internet and fully-equipped fitness centers cater to modern needs. Restaurants are destinations in their own right among locals and visitors who demand regional ingredients within cosmopolitan dishes. Best yet, these accommodations offer direct access to Brussels' best museums, shops and cafes. Of course, guests can enjoy all these advantages and more when they book the Ice Magic package. In addition to staying in some of the most spacious and attractive hotel rooms in Brussels, visitors can look forward to complimentary breakfast and, upon their arrival, a welcome glass of Glühwein, that beloved regional drink made from red wine mulled with raisins and spices. The promotion involves more than a warm welcome. As one of the most exciting Brussels hotel packages available, Ice Magic also includes one voucher booklet that lets visitors experience the best of Brussels' wintertime attractions. The Bruges Snow and Ice Sculpture Festival - whose theme this year is, appropriately enough, Ice Magic -- is made even more accessible thanks to the buy-one-get-one-free ticket voucher. (Inspired by tales like "Harry Potter" and "The Lord of the Rings," the sculptures express a literal interpretation of ice and magic.) Art isn't confined to frozen water, though. Guests will also find a voucher for a 50-percent discount on adult rates to see "Art of the Brick," a traveling exhibit of LEGO-built art that is making its European debut in Brussels. Ice skating, free Ferris wheel rides and other goodies are all included in the booklet as well. Plus the Ice Magic package includes proper kitting for sightseeing in chilly winter weather -- guests receive a complimentary scarf and pair of gloves upon arrival. Rates for Ice Magic are based on double occupancy and start at EUR 81 per night at the Renaissance Brussels Hotel and EUR 129 per night at the Brussels Marriott Hotel. The package is available during weekends only until 9 February 2014. Travelers interested in booking the package should visit www.marriott.com/brussels, choose a hotel, choose dates and view the available packages. Elegantly residing in the same place where an island once stood in the middle of a river, the Brussels Marriott Hotel embodies the best of history and contemporary luxury. The four-star property features renovated accommodations, sumptuous bedding, spacious work areas and wireless Internet, along with a fitness center, sauna and the trendy Midtown Bar & Grill restaurant, where local ingredients enhance U.S. prime beef steaks. Six meeting rooms afford 6,780 square feet of versatile event space for corporate guests, who may unwind in the luxurious Executive Lounge after a successful day of meetings. 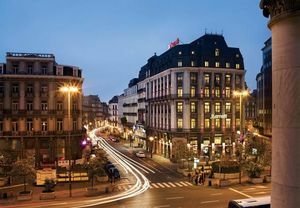 And the hotel's enviable, city-center location puts guests just minutes from the Grand Place, Mont des Arts and countless other museums, shops and cafes for a vacation that is as dynamic as the hotel itself. Located in the European Quarter and close to the chic boutiques along Avenue Louise, the Renaissance Brussels Hotel is as quintessentially Belgian as it is luxurious. The 262 guest rooms and 18 suites feature flat-screen televisions, high-speed Internet, 24-hour room service and plush bedding. Equally convenient is the state-of-the-art fitness center, which offers fitness classes, personal training and access to the sauna and heated indoor pool. Two restaurants, the hugely popular Parnasse Bistro and the trendy Schengen Bar, bring the best of Belgian dining on-site. Ten meeting rooms include the vast Brussels Ballroom and feature 6,824 square feet of space to welcome corporate travelers, while the exclusive Club Level promises to take an already memorable experience to the next level of luxury. Elegantly residing in the same place where an island once stood in the middle of a river, the Brussels Marriott Hotel embodies the best of history and contemporary luxury. 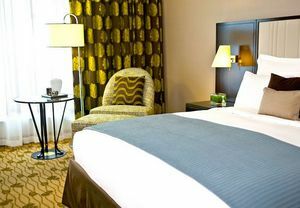 The four-star hotel features renovated accommodations, sumptuous bedding, spacious work areas and wireless Internet, along with a fitness center, sauna and the trendy Midtown Bar & Grill restaurant. Located in the European Quarter and close to the chic boutiques along Avenue Louise, the Renaissance Brussels Hotel is as quintessentially Belgian as it is luxurious. The 262 guest rooms and 18 suites feature flat-screen televisions, high-speed Internet, 24-hour room service and plush bedding.